The Bolingbrook Babbler: Mythbuster crashes UFO into Bolingbrook! Adam Savage, cohost of The Discovery Channel’s Mythbusters, crashed a class K09 Class UFO into Bolingbrook’s Clow UFO base. Although the spectacular fireball could been seen up to five miles away, no one died in the crash, and Clow was operational after one hour of covering up the accident. According to a Clow space traffic controller, Savage sent out a distress signal Saturday morning. Savage told the officer that his compass was spinning, and his navigation system was malfunctioning. The officer cleared Savage for an emergency landing at Clow. After guiding Savage into Bolingbrook air space, the craft’s propulsion system failed, and it crashed into the civilian airport runway. According to Savage, now recovering at the Clow medical lab, he was split in half as he blown out of the craft. Savage credits Clow advanced medical equipment for saving his life. Clow’s doctors were able to reattach Savage’s lower body and replace most of his organs. Savage says it he’s sore, but has no scars or permanent damage from the accident. According to Savage, The Mythbusters were filming a commercial for the interstellar broadcast of the Super Bowl. LoGock Industries wanted them to “bust” the myth that the K09 malfunctions once it reaches Earth. The ad was to be similar to the Diesel Diary ads on their web site. Savage and the Build Team went to Mars to assemble a K09 from a kit. Savage would then fly the craft back to Earth while the rest of the team followed in a more modern craft. This reporter managed to listen into a teleconference between the build team and a LoGock representative. The insurance representative accused the Mythbusters of deliberately crashing the craft. “That’s my baby!” Yelled Kari Byron over the screen from her home. Byron, who was feeding her daughter, defended the Build Team, saying that she oversaw their work by reviewing their daily transmissions from Mars. 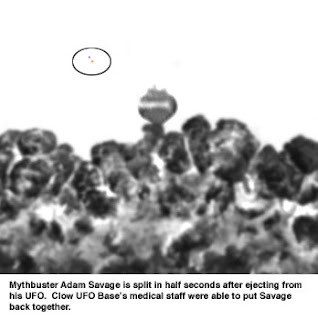 When asked to comment, fellow Mythbuster Jamie Hyneman laughed and said that Savage was standing next to him. At least you'll wring some small amount of nostalgia out of UFO before the harsh reality of its many, many problems sets in.